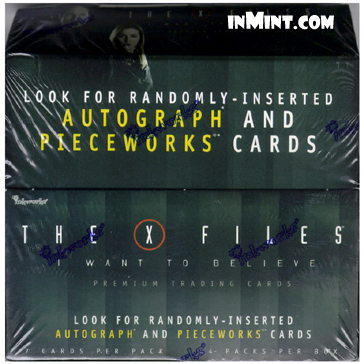 Look for randomly-inserted AUTOGRAPH and PIECEWORKS cards. 72 Base Cards featuring: Movie Story Cards, Character Cards, Revelations Cards. Randomly inserted Bonus Cards feature: 9 IN SEARCH OF Cards (approximately 1:11 packs) 6 WANTING TO BELIEVE cards (approximately 1:17 packs), 3 BACK TO BASICS Cards (appproximately 1:23 packs), AUTOGRAPH Cards and PIECEWORKS Cards.